Like another reviewer, I have practically visible eyebrows. I started using this producrt, and I am very please wit the results. Rather than apply with a brush, I use one of those small foam applicators that come with eyeshadows. This gives my brows a more natural look. Looks very soft. I'm very impressed with the staying power of this product. I also like that the lighter shade (honeypot) isn't too dark, though it is still for dark blondes. The powder is easy to blend and the way stays in place. The box can be a bit awkward, but the product inside is nice. Love the blendable dual colors. Not that i often tweeze or touch up my eyebrows on the go, but the idea that this was so portable (i was thinking easy to pack for vacation) was why i wanted this in the first place. 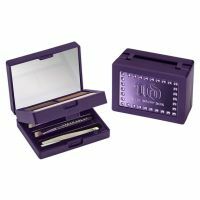 Comes with wax to keep the shape of your brows, two colors to fill 'em in, mini tweezers and a brow brush, all in a teeny 2 inch box. I have light to medium skin and dark brown hair, i purchased Beige Betty which look...read moreed most natural on me. (Don't go darker than your hair, it looks unnatural). I've had mine for about 6 months, i've barely put a dent in the wax and powder. I took off two stars cause the little brush has kinda frayed, not as thin as it was new, and the tweezers are somewhat difficult to use, they barely grab hairs.